On the weekends, Ginza Street is closed off to vehicle traffic and opens up to pedestrians. 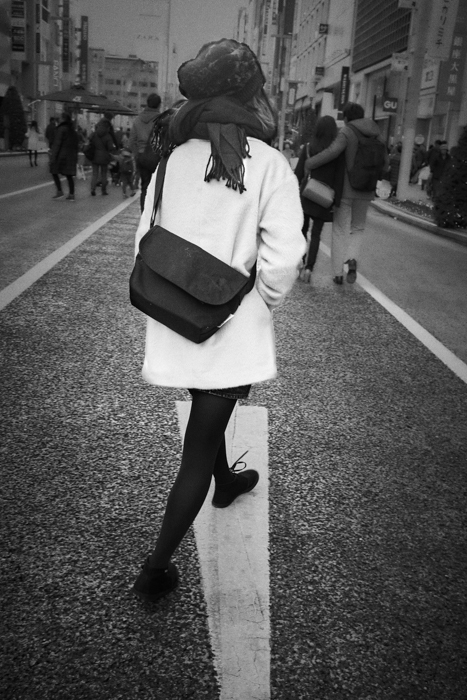 I enjoy walking through the bustle of Ginza, as I watch the backs of people walking in front of me. Since I can only see their backs, I imagine what kinds of conversations they're having. I feel a kind of connection in my mind with these people that were, up to that point, complete strangers to me. It's then that I realize that I have found a sense of belonging in that space. I think that I can continue watching, imagining a connection with these people, and finding a place for myself within each time and place. This relationship and expression of being is the starting point that allows us to recognize each other as humans and coexist.